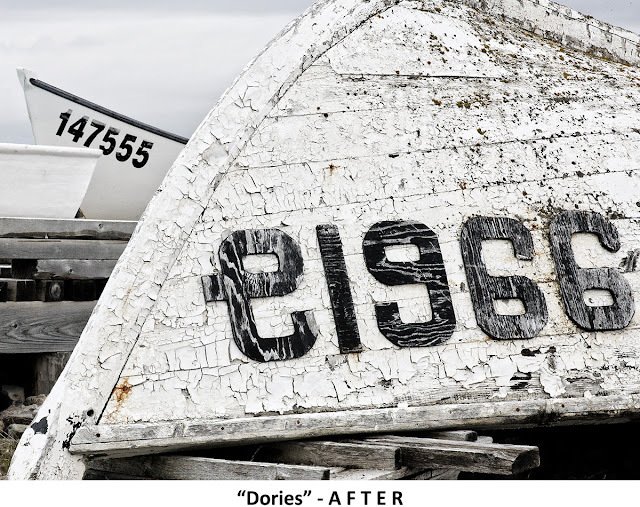 The dory, with its characteristic high sides and sharp bow, is a wooden fishing boat traditional to the northeastern United States and eastern Canada. 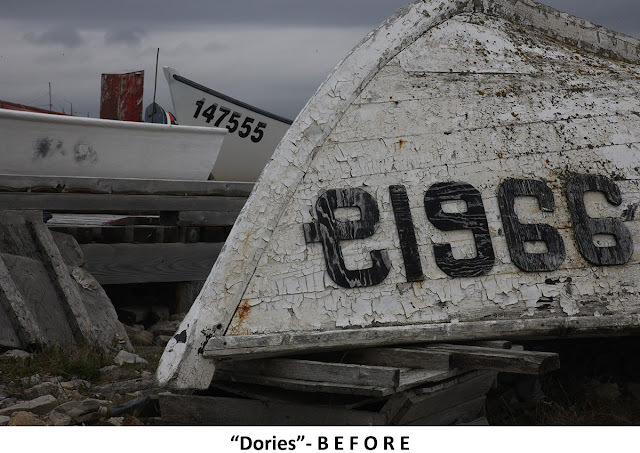 I found this fleet of beached dories at Forrester's Point on the west coast of Newfoundland. The BEFORE image is badly under-exposed - this was easily fixed by tweaking the exposure setting of the RAW file. I brought out the detail of the flaking paint with fine-contrast adjustments. I also loved the contrasts of the gray, black and white tones - I accentuated them with tone curve adjustments. The interesting part of the image is in the right two-thirds of the frame. The content of the extreme left side of the BEFORE image is unattractive and distracting. I wanted to play up the tension between the downward curve of the foreground dory's hull, and the dark upward line of the background dory's gunwale. Similarly, I wanted to make the most of the contrast between the upside-down and rightside-up numbers. The simple way to deal with all these issues was to crop the image, mostly from the left and a little from the top and bottom. Even after cropping, I was left with the distracting top of the outboard motor on the third dory. Eliminating it by cropping even further from the left would have removed the upward line of the background dory's bow, which I didn't want to do. So instead I used the cloning tool in photoshop to eliminate the outboard motor.